This species probably bred in the county during our First Atlas period, when birds were at Risley Moss (SJ69Q and SJ69R) in 1979 and 1980. The text in the First Atlas, and the county bird reports for those years, describe the records as ‘pairs’ (probable breeding), yet they were mapped as confirmed breeding. No more information is available to re-assess these records. Whatever their status, this was the last time that two birds were found together in Cheshire and Wirral. Since then, the annual bird reports show single males uttering their weird nocturnal ‘song’ (‘churring’) for up to three days each year in 1985, 1986, 1993 and 1994, with odd records of single birds present in 1989, 1991 and 1995, and three single birds seen in 2000. There were two records during this Atlas, both from the north-west Wirral. On 11 May 2004 a male was flushed from private land near Red Rocks Marsh (SJ28E) and a bird was churring from 4 to 7 May 2005 at the Wirral Country Park at Thurstaston (SJ28G). Nationally, Nightjar is on the Red List of species of conservation concern because of its major contraction in range: the 1988-91 BTO Atlas showed that it had been lost from more than half of the 10-km squares occupied in 1968-72. The population was also thought to have halved between 1972 and 1981. There was then a dramatic reversal in its fortunes, as a national survey in 1992 showed that the population had risen by 50% since 1981, probably due to increased availability of young forest habitat as plantations were felled and replanted (Morris et al 1994). The latest national survey in 2004 found a further 36% increase in the UK population in 12 years (Conway et al 2007). These apparently contradictory findings indicate that the species is doing well in its core areas, but is being lost elsewhere. The 2004 survey found evidence of population declines and range contractions since 1992, in North Wales, northwest England, and Scotland. Most birds are in southern and eastern England, although there are outlying groups father north, especially in the North York Moors and Dumfries and Galloway. The nearest birds to Cheshire and Wirral are in north Wales and at Cannock Chase, Staffordshire. 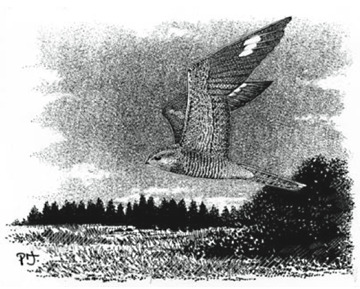 The 1997 UK BAP includes a long term target (by 2017) to restore Nightjar to parts of its former range, including in north-west England. There is a Cheshire BAP for the species, but it has had little action and no success so far. There is little of their favoured heathland habitat in the county, although suitably-managed young conifer plantations would meet their needs, provided that there are enough large moths for them to eat.